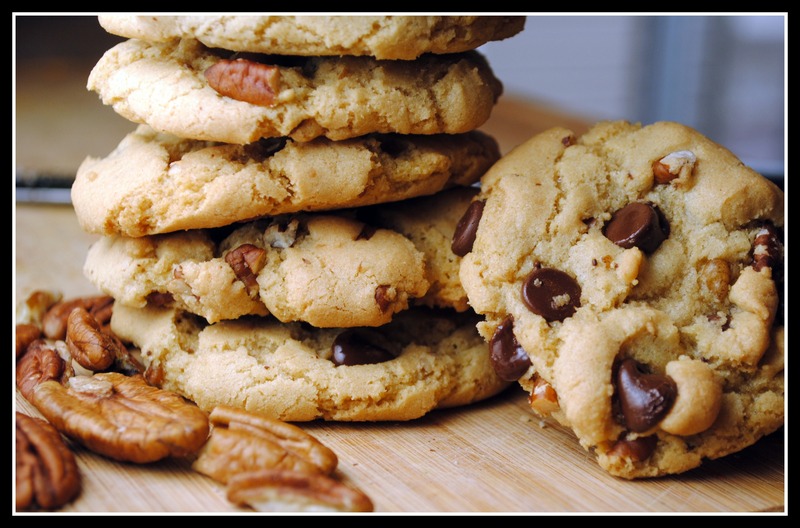 Brown Butter Chocolate Chip Cookies + $500 Visa Gift Card Sweepstakes from Melt! If there’s one section of the grocery store where things get a little grey, it’s the butter section. At least for me. As someone who’s always trying to walk the fine line of health (i.e. low-calorie in my case) and what’s truly “healthy,” I can come up with more questions than I can answers about most of the products on the shelves…even as an RD. What a shame. What I do know is that eliminating as much trans fat as humanly possible (and that is entirely possible as trans fat does not naturally occur in foods — processing and frying of foods puts trans fat into our foods). I also know that margarine contains trans fat (margarine = vegetable oil hydrogenated into a solid, spreadable “butter” spread). Which leads me to butter as a front runner…and now, to Melt Buttery Spread. Melt is the latest and greatest in buttery spreads and quite frankly, it has a lot to offer (And believe it…this is the first product review I’ve done in…years. For a reason.). Outside of the fact that this buttery spread actually acts like butter (um, check out these cookies…if something with Melt were to flop, these would’ve been it), it has a laundry list to boast about. Not only is Melt 20% lower in calories per tablespoon when compared to butter, but it also contains 1 gram of polyunsaturated fat and 3 grams of monounsaturated fat (these are the heart-healthy fats that actually help to LOWER the “bad cholesterol” — LDL). It also offers up 15% of the daily value for Vitamin E, a powerful antioxidant vitamin that many Americans are deficient in. The Melt blend consists of virgin coconut oil, organic flaxseed oil (which contains omega 3’s! ), organic palm fruit oil, and organic canola oil which are all healthy cooking oils. 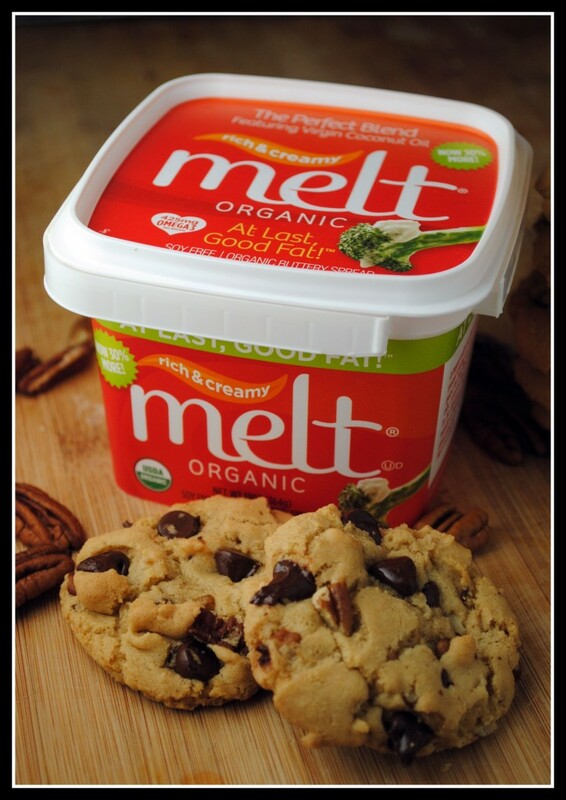 Melt is USDA organic, all-natural, soy-free, and gluten-free. And most importantly, it tastes great, can be used in baking just like butter (hello, the holidays are coming! ), and offers less calories and more nutrition than any other butter or butter substitute on the market. Heat pan on medium heat. Place Melt/butter in the pan and allow to melt, stirring occasionally. Once Melt/butter is melted, stir constantly for about 5 minutes until the butter bubbles up several inches. Continue stirring, until Melt/butter has reached a nice brown color. Once browned, pour the Melt/butter into a bowl and and refrigerate until solid again. Cream the (solid) brown Melt/butter and the sugars until mixed well. Scrape down the side of the bowl. Continue mixing while adding the eggs one at time. Make sure each egg is incorporated before adding the next. Add the vanilla. Mix well for a few minutes until batter it light and fluffy. Scrape down the bowl with a spatula. Combine the flour, soda and salt in another bowl. With a whisk, stir to combine. With the machine on low, slowly add the flour. Mix until just combined, taking care not to over mix. With a spatula fold in the chocolate and pecans. Drop by spoonful onto parchment-lined cookie sheet. Bake for 11-13 minutes. They should be lightly golden on the outside but still look gooey on the inside. Yield: 5 dozen cookies. Nutrition Information (per cookie): 100 calories; 4.8 g. fat; 7 mg. cholesterol; 84 mg. sodium; 14 g. carbohydrate; 0.7 g. fiber; 1 g. protein (made with butter: 106 calories; 5.4 g. fat). 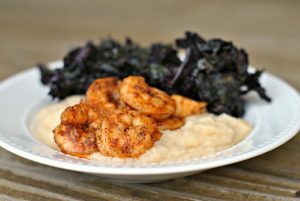 Result: Flipping delicious! No Melt? No problem. The original recipe called for butter. The Melt worked great and if I’m being honest, I’m totally impressed. 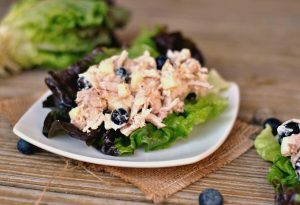 Using Melt in place of butter cuts 320 calories and lots of saturated fat from this recipe, as well as adding in the heart-healthy fats and omega 3’s. I also halved the amount of chocolate chips to lighten things up a tad. A pound of chocolate is just a bit excessive, I felt! I also subbed in a bit of whole wheat pastry flour for some fiber, but you certainly don’t need to. Enjoy! With all that said, Melt is offering one lucky blogger (that could be me!) and one lucky reader (that could be you!) EACH a $500 Visa gift card to use towards a “Mingle with Melt! Dinner Party” for you (and I), plus 10 of our nearest and dearest friends and family. Cool, huh? I’ve never heard of this before!! I’m wondering if the coconut oil would give me stomach issues. Hmmm…I know that milk does, but would the oil? I’ve never tested it, but..I think I’m taking my chances! Thanks Nicole! BTW, we need to get together sometime before Christmas and do holiday baking or something. Maybe get some Starbucks coffee and have a day in the kitchen making holiday baking gifts. I want to make my granola and possibly some other holiday cookies. I’ve always tended to sway towards butter as the front runner, too. Margarine often skeeves me out. And truth be told, I’ve used both for the same recipe and gotten MUCH better results with butter. But it’s good to know spreads are starting to greatly improve! I’m curious your thoughts about palm oil. I’ve heard it’s heavy in saturated fats. Although, I’ve also been learning through coconut oil articles that not all saturated fat should be treated the same. Thoughts on this? Those cookies look absolutely perfect!! Seriously, so picture perfect. I can smell them now. 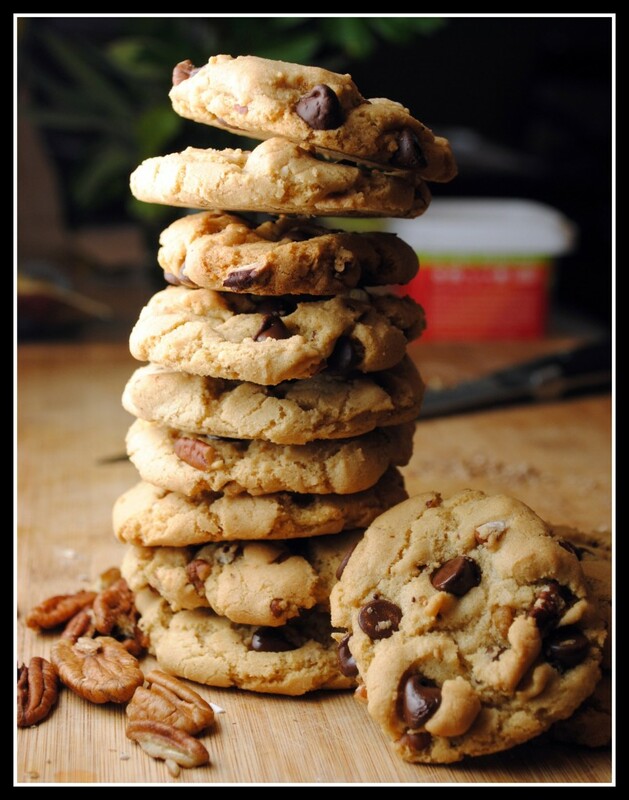 Oh goodness – those cookies look heavenly. They’re begging to be dunked in milk! These cookies look amazing! Love that melt uses coconut oil. Oh I re-read up top again..guess I wouldn’t get to meet you. 🙁 But winning the sweepstakes would still be awesome! Mmmm, these cookies look amazing!!!!!! I was drooling as I read the title ::bangs head on desk: I.Must.eat.cookies. I always wonder about the differences between butter and butter type spreads. I usually go with butter just because its easier. This sounds really good though – especially since those cookies look incredible. Hey there Nicole. Could I write my post tonight about your Melt giveaway and your cookie recipe, which, by the way, I will be trying in the next couple of days. I’m going to have to look for this Melt stuff! Though I’m still a butter fan… It’s not good for me, but I looooove it! The cookies look amazing too! Hi Nicole, I’ve never heard of this. Guess it hasn’t made it up over the border to us in Canada yet. From the looks of your photos, it sure bakes up beautifully! Have a great Wednesday!! I tend to lean toward using real butter instead of margarine. Guess I like the real foods, but this melt does sound awesome! Were there any weird added ingredient ls to it? These cookies look like the bomb! Thank you for reviewing this product. I am borderline high cholesterol. This product isn’t available where I live yet but I hopefully one day it will be. I’m totally drooling over your cookies! mmm. Just entered 🙂 glad you liked the Melt! I can’t believe these have wheat flour in them and they still look as good as they do! They still look moist and not dry or crumbly at all!